Oh man, those days when we were standing in packed tents, being overwhelmed by a massive wall of sound while we were soaking in our sweat, brutally headbanging to whatever the bands threw at us. Our girlfriends loved this too because of the female vocals and the elegant and extravagant dresses these vocalists wore. I wonder what became of those girlfriends of long lost times. I wonder what they would feel like when they came across this new album by Sinners Moon. Would it remind them of those times too? I'll probably never find out, which is a good thing. The past should remain the past, except maybe if it considers music. 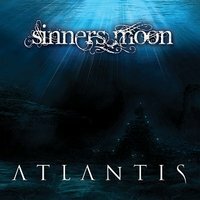 Sinners Moon started out as a solo project in 2010. However, realizing this was music to be enjoyed by audiences far and wide, Luk?? Navr?til decided to search for band members. A number of line-up changes followed, including three different vocalists. Vocalists usually make or break a band in the symphonic metal genre so it must have been a difficult road for Sinners Moon. Yet, after all these changes and set-backs, they are back with a brilliant album that has a perfect blend of power and melody. Supported by a solid sound, Simona's and Derrick's voices fit in perfectly. Atlantis is an album about hope, about loss and about loyalty. Now, I've never been a huge fan of bands like After Forever and Epica, let alone Nightwish, but I've always found it interesting how these bands have managed to make metal sound so strange and out of this world (or time) while still rocking hard. Sinners Moon does exactly that. To me they really surpass the likes of Nightwish and many others in the female fronted symphonic metal genre (that sure are a lot of bendings to avoid the word 'goth metal'). Another band I'm not really fond of by the way, is Sonata Arctica. Yet, Tony Kakko appears as a guest singer for 'My Servant'. I can imagine this being a huge plus for Sinners Moon and they do deserve it, but to me the male vocals by Derrick in the other songs are a lot better. I think I just like my set of grunts once in a while. They give the album that almost 'vintage' gothic metal touch that I loved back in the days. So do the elaborate keyboard arrangements. Combined, all these elements make a song like 'Dark Episode' or 'Buried' simply awesome and highly appropriate for a neckbreaking headbanging session.